There is no doubt that Wikipedia is the world's most trusted online book for internet readers, that adequate with all the details and citation for any kind of topic (i.e. from A to Z). Anyone can be an author or an editor of almost any article available on the Wikipedia - the free encyclopedia, that makes it a perfect example of internet democracy. But being a full-scale online booklet it takes much time for reader's to have a glance at all the lengthy information, So the better choice would be printing and saving copies of wiki articles as PDF - The Universal Document. < Print and Save Wikipedia Articles into PDF for Offline Reading ? In some countries such as 'Hungary' using the internet are still expensive, so if you're really concerned about the internet data thrift, reading an article on the internet with several background applications open and running would drain your internet soon, so it's better to stay offline when reading article's that doesn't require any active script running. Creating PDF of Wikipedia articles is simpler than you think, just follow these simple steps to create one. See Also: How to search Google effectively with search operator's. How to Create eBook with Multiple Wikipedia Articles and Download as PDF file ? Now you will find an added feature at top of any wikipedia article that lets you "add this page to your book". Add any no of Wikipedia pages to your ebook and click show book to view the added pages. Once you have finished adding all Wikipedia articles to your book, Click show pages to manage, order and format the pages to be downloaded. Scoll to Print and Export on the left sidebar of the page and click the drop down to view "Download as PDF". 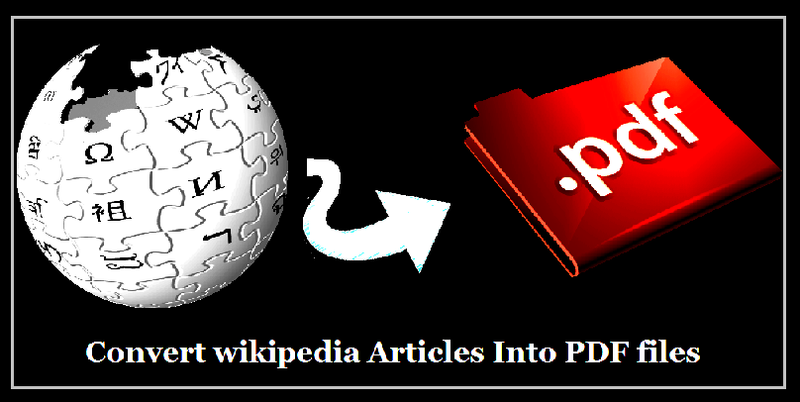 Click "Download as PDF" to print and save wikipedia articles in random. When the rendering process is finished, you will be provided with a link to download the rendered file into your computer. Save the PDF file in your preferred location. As an alternative, If you're an chrome user you can download and print any wikipedia article randomly to any location destination such as Microsoft's OneNote, XPS Document Writer (or) straight away print it as FAX.
" Press Ctrl+P on any wikipedia article to print and save in any preferred local destination "
Note: Not only wikipedia article's, Chrome web browser users can download any article on any website site as PDF. The contents downloaded from wikipedia with key press " ctrl + p " in chrome and "download as pdf" utility in wikipedia were identical but the template layout of both the download process is relatively different.